Nellikkai pickle is my favorite pickle. 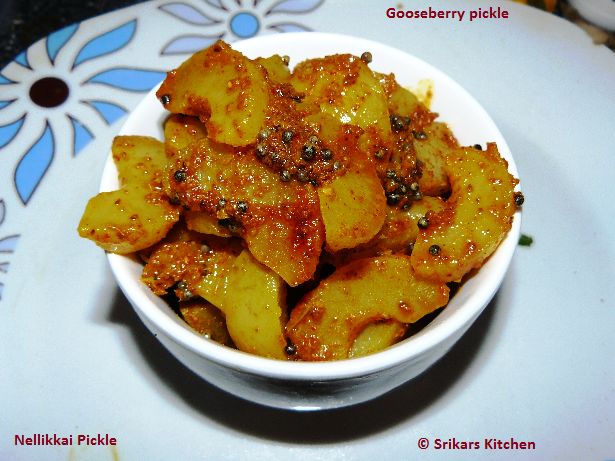 Normally My grandma used to make neer nellikkai(soaked gooseberries) and use the same soaked gooseberry to make this pickle. This is very best combination for curd rice. I always used to make mango pickle and Tomato garlic pickle. I have never made this for a while. Once when i called my mom, she told me the recipe. It came out really well & tasty. Boil the goosebeery & remove the seed and keep it aside. Heat the sesame oil, add mustard seed & allow to temper. Add to the pickle & mix it well.Serve with Curd rice.